Approximately 11 pieces in a pound. This gift tin has a diameter of about 7 in, a height of about 2 in and a Net WT of 1 pound. It’s not hard to imagine what happens once the lid comes off. Naturally, any thoughts of resistance fly right out the window; the question that remains is whether your gift recipient can maintain composure in the face of 16 ounces of pure bliss! That’s why our premium chocolate covered apricots make such a wonderful gift for so many special occasions. Have you got a milestone birthday coming up? An anniversary or day of remembrance? A gift of our exquisite Chocolate Dipped Apricots just makes any event more memorable. And when presented as a business gift, nothing conveys your appreciation and good wishes quite so elegantly as this beautiful tin (and of course, the fabulous delicacies inside). Perfect for holiday observances, too—and we’ll be happy to ship direct to your recipient’s door, with personalized greeting included, for delivery by any date you specify. What could be easier? I purchased these for my 20 something son for Christmas. He absolutely loved them AND they came in a beautiful tin that kept them fresh. Will definitely order again. Wow - didnâ€™t realize they grew apricots so big! The dark chocolate is a good compliment to the fruity taste. This was a birthday gift for my son. It arrived on time, was very well packed and he enjoyed every bite. He said the apricots were delicious! I will use your company again and will highly recommend you to my friends. Would definitely purchase these again. They are a real treat! I look for these at anniversary time for my wife and this year we found a great source. ProsVery tasty and beautiful on a plate. Also, the presentation lovely if giving as a gift. 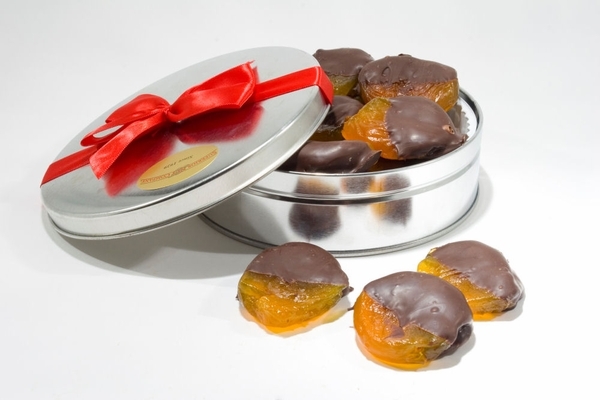 Dark Cocolate dipped Glazed apricots gift tin. I'm familiar with the chocolate covered apricots. They are very good and delicious. I bought this item for my daughter as gift. Soft, moist, top quality. Expensive, but a real treat. I buy your dark chocolate dipped glazed apricots as a gift for my fiancee. I have tried a number of other vendors, but your product is superior to all the others in the opinion of the only one who matters: my fiancee. For that reason alone I will never try another source, but in addition to her taste preference your service and the year around availability have no peer in my experience. Item delivered on time,in good shape. The consistency and flavor are superior! ProsPresentation and a very special item! This is the third time I have purchased this item as a gift. All three times a winner. The apricots are delicious and beautifully presented. I have bought the chocolate dipped glazed apricots a couple of times. Not for me, but for a friend. The reports I have gotten from the friend are that these are very tasty and she was delighted to receive them. Love these apricots. I always include them as a Christmas gift to myself. ProsThe apricots are juicy sweet adn big enough for a 2-3 bite treat when my sweet tooth kicks in. This is the second time I ordered these Apricots. I purchased them as a special treat for myself (but I did share them). The cost to ship them to Florida was pricey bearing in mind that 2 ice packs were used. Even with the 2 ice packs, they still arrived completely thawed. The chocolate, however, wasn't melted I will order these again and I highly recommend them to everyone. ProsI'm getting my fruit and the rich dark chocolate actually has health benefits. It doesn't make you feel guilty about having this treat. There is nothing better than glazed apricots from Australia. They are large and juicy but then the best is to have these yummy fruits dipped in dark chocolate, what can I say? There is nothing con about them other than there just aren't enough in the tin! Like I said, "Hmmmmm hmmmmm good! ConsThere are not enough in the tin! I ordered these for a friend and happened to be there when she got them. Fortunately she shared...mmmmm... if you are wavering... ORDER THEM... what a treat! Moist, succulent apricots melt in your mouth along with the exqusite dark chocolate. The best in the industry, and I've purchased many other chocolate-dipped apricots from other companies. Makes the end of summer more tolerable, and puts one in mind of the season to come. I was looking for this item on the internet, not your brand, because I did not know it, but they were excellent and will order them again soon, either for me or for gifts. Keep the good quality. Excellent quality,delicious and attractively packaged. The dark chocolate covered apricots are the most amazing delicious treat! I highly recommend them. They were great! I purchased them as a business thank you gift and the person I got them for loved them! I bought these chocolate covered apricots as a fathers day gift. They got there right on time an were fresh and delicious. Will definetly be coming back for more! I love the chocolate dipped apricots - I order them repeatedly! I would like to see a smaller tin at a lower price. Easy to order. On-time delivery. Quality product - tastes great! The fruit was grade "A" number "1" - freshly candied and the chocolate was perfect! My Mother in Hawaii really thought these chocolate dipped apricots were the best! Beautiful, big, fresh, and tasty with a hint of decadence! Really yummy! I highly recommend the Superior Nut Company for their wonderful products and outstanding customer service. The company name really describes them accurately---Superior in every manner. I will definitely be using the Superior Nut Company for my future gift purchases. The chocolate covered apricots were some of the best I have ever tasted and will certainly buy them again for myself and as gifts. Excellent! Most importantly, the product was extremely high quality and exactly as described. These are the BEST chocolate covered apricots we have ever had!! Huge, moist, tender, flavorful and totally delicious. The process for ordering was easy and the delivery timing was on the mark. A wonderful experience in every way. I will definitely order from them again. I have sent these Chocolate Dipped Apricots a number of times to family and friends. I always receive wonderful responses. These are the best chocolate dipped apricots you will ever have. Absolutely incredible.